Spanish Finance Minister Elena Salgado said there’s “absolutely” no risk the country will need an international bailout as its borrowing costs compared with Germany’s surged to a euro-era record. Asked in an interview on Punto Radio in Madrid if Spain risked having to seek a rescue like Ireland or Greece, Salgado said “absolutely not.” The euro faces “speculative attacks” which Spain is in the “best conditions to resist,” she said. (Full Story). On November 17th in How Far Could Stocks Fall, we used various methods to look at the S&P 500’s potential downside risk. 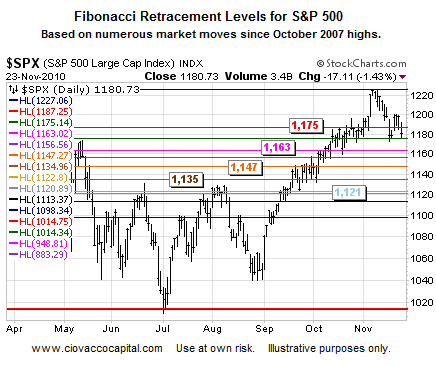 One method used in the November 17th analysis was Fibonacci retracements. We decided to expand the retracement analysis since the market remains fragile due to concerns related to tensions between North and South Korea, as well as the ongoing debt-related problems in Ireland, Portugal, Spain, and Italy. 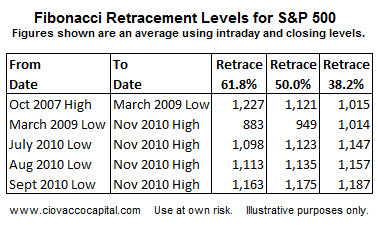 Being aware of retracement levels can help you make more informed buy and sell decisions. For example, if the current correction were to build some momentum, you may decide to wait for a retracement level to be violated on a closing basis prior to reducing your exposure to risk. The basic concept is all markets have natural ebb and flow where “giving back” some gains is a normal part of any healthy market. Retracements bring new buying interest and allow markets to move higher. Retracements pertain to both market advances and market declines. They can be calculated using closing prices or intraday prices. In this expanded analysis, we added a few additional market moves and calculated the retracements using both closing and intraday prices. The values shown in the table above and graph below are the average results using closing and intraday prices. The levels enumerated below deserve the most attention based on a variety of factors, such as trendlines (not shown). One of the most common mistakes made by individual investors is to underestimate the short-to-intermediate-term impact of loose monetary policy. This QE resources page can help you better understand the Fed’s impact on the price of stocks, gold, silver, copper, etc. Copyright (C) 2009 Ciovacco Capital Management, LLC All Rights Reserved. Ciovacco Capital Management, LLC is an independent money management firm based in Atlanta, Georgia. As a registered investment advisor, CCM helps individual investors, large & small; achieve improved investment results via independent research and globally diversified investment portfolios. Since we are a fee-based firm, our only objective is to help you protect and grow your assets. Our long-term, theme-oriented, buy-and-hold approach allows for portfolio rebalancing from time to time to adjust to new opportunities or changing market conditions. When looking at money managers in Atlanta, take a hard look at CCM. All material presented herein is believed to be reliable but we cannot attest to its accuracy. Investment recommendations may change and readers are urged to check with their investment counselors and tax advisors before making any investment decisions. Opinions expressed in these reports may change without prior notice. This memorandum is based on information available to the public. No representation is made that it is accurate or complete. This memorandum is not an offer to buy or sell or a solicitation of an offer to buy or sell the securities mentioned. The investments discussed or recommended in this report may be unsuitable for investors depending on their specific investment objectives and financial position. Past performance is not necessarily a guide to future performance. The price or value of the investments to which this report relates, either directly or indirectly, may fall or rise against the interest of investors. All prices and yields contained in this report are subject to change without notice. This information is based on hypothetical assumptions and is intended for illustrative purposes only. THERE ARE NO WARRANTIES, EXPRESSED OR IMPLIED, AS TO ACCURACY, COMPLETENESS, OR RESULTS OBTAINED FROM ANY INFORMATION CONTAINED IN THIS ARTICLE. PAST PERFORMANCE DOES NOT GUARANTEE FUTURE RESULTS.